Home > Real Estate - Surveys > A review the top trends in real estate asset classes and what can transpire in The new year 2017..
A review the top trends in real estate asset classes and what can transpire in The new year 2017..
A review the top trends in real estate asset classes and what can transpire in 2017..! On the demand side, the office space requirements of sectors such as manufacturing, logistics, FMCG, etc., showed positive signs in 2016, and we expect this to continue in 2017. Office space required by eCommerce/ start-ups and consulting firms rose, as these sectors are expected to continue with headcount addition to accommodate their business growth in the years to come. International banks and financial institutions are under increased cost and compliance pressures and are therefore expected to outsource more jobs to India. Depreciation of the INR versus the USD and Euro is likely to play a major role in this. That said, the office space needs of technology and outsourcing firms (especially in software development) slowed down in 2016. The pace of growth of top technology firms was in single digits due to global uncertainty and technological disruption. From the next year onward, some of these companies could see some implications from Trump’s policies, but it is too early to predict accurately how these could play out. It remains to be seen if Trump's policies could negatively affect lower-grade work carried out by contact centers in India. Adoption of technology will continue to increase across businesses in 2017. Pertinently, the ratio between growth of a business and its real estate requirements will change, as technology is proving to be a disruptor across sectors. The technology sector is becoming less people-driven and more process-driven. Due to the increasing use of technology, a company witnessing a revenue growth of USD 1 bn could require only 20,000 employees in place of 35,000 it requires now. Unlike earlier, Indian corporates - including historically lease-averse companies like Infosys and TCS - have started showing a propensity towards leasing versus buying. Earlier, many Indian IT firms preferred constructing their own campuses. Now, as the contracts of many of these companies get shorter, they prefer to lease. For many companies, especially in non-technology sectors, money saved through leasing is reinvested in business. Newer Fortune 1000 companies are already looking to increase their exposure in India. Higher FDI is expected to flow into India as it improves on the ‘ease of doing business’ rankings and policies are made more investor-friendly. The Mr. Modi government’s focus on wooing foreign investment is helping. Demand has been steady so far - and if GDP growth sustains, demand will start looking healthier. The overall demand for commercial real estate in 2016 is expected to amount to 34.2 million square feet once the final readings for 4Q 2016 are in, on the back of healthy absorption and pre-commitments. Out of this, the net Pan-India absorption up to 3Q16 stood at 26.4 mn square feet. Although availability of right space at right location remains a challenge for many occupiers, nearly 38 to 40 million squrare feet of new space will be added in 2017. Thanks to more investment in infrastructure, tier-II cities likes Pune, Hyderabad and Chennai are expected to drive office demand in 2017. Quality spaces are already available at competitive rentals in tier-II cities compared to tier-III and tier IV cities, and the former will see more supply in the years ahead. Even as vacancy lowers across key cities, the supply of good quality assets continues to diminish. Vacancy in high-quality assets is far lower than average vacancy. Assets of poorer quality or at inferior locations or which are strata-sold (in Delhi-NCR and Mumbai) have a much higher vacancy, except in the IT cities like Bangalore, Pune, Hyderabad and Chennai. The scarce future supply may limit the absorption to be realized. 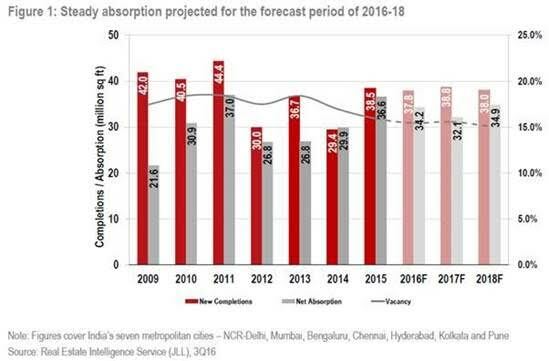 The net absorption in 2017 is likely to be lower than this year due to scarce supply, and this may be acute in Chennai and Pune. Rents will resultantly grow in even in Grade-B buildings and in certain micro-markets. The pace of rental growth will not be uniform across cities and micro-markets, as some may have run their course already. Demand for office space is evolving, and more corporates across industries will adopt innovative workplaces in the near future. Collaborative office spaces with open areas to boost employee productivity geared to attract and retain talent will gain importance from 2017. Going ahead, tech-enhanced offices with a focus on sustainability and energy-efficiency will command higher rents. To reduce their financial burden and also to motivate and retain talent, more corporates could turn towards co-working spaces. There is currently very limited supply of co-working spaces; however, once that situation improves, the demand for them will be considerable. As bigger co-working players enter India and more such facilities emerge across cities, this category will prove to be a disruptor. Developers, private equity funds and REITs will continue to invest in premium office assets, and in upgradation of existing buildings that they own into higher-quality ones. With the implementation of RERA, there will be standardization of space standards. This will, in turn, help these stakeholders to render their assets REIT-compliant. Due to RERA, REITs and demonetization, more and more office assets will become institutionalized. The demand for strata-sales will also decline, especially in Delhi-NCR and Mumbai.